Super value green key lockable notice boards with a grey felt pin board back panel. 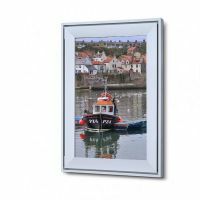 This poster frame can be displayed portrait or landscape, and door stays hold the frame open whilst you change your poster. Available in 11 different sizes and bespoke sizes also available. Do just call for a quick quote on 0845 465 1027. Cheap green notice boards with quick delivery. Delivery is a flat rate of £10 + VAT to London and the UK mainland.